Take your camp comfort to the next level with these toasty down booties. 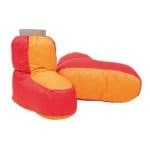 700+ fill power European duck down, 5 individually filled down chambers, and an elastic cuff means that these booties will keep your feet super warm day after day. Combine with the Exped Bivy Booty to create a warm and waterproof camp shoe!